Some of the anglers stay close to the contour line while others, including me, venture into the middle of the horseshoe. 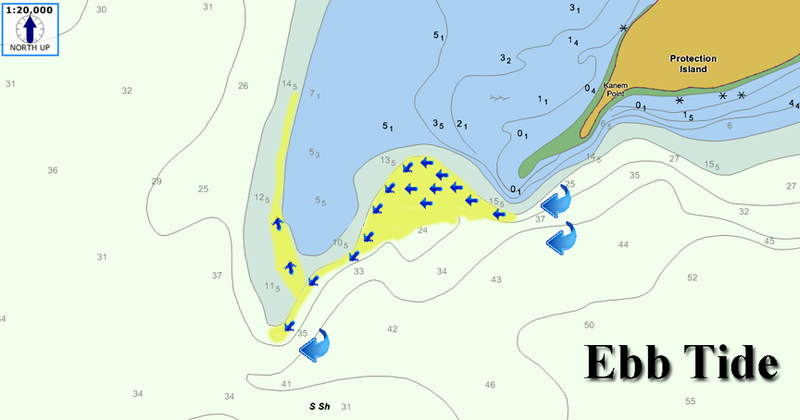 My trolling pattern varies according to currents, trolling with and against in search of bait and salmon. Take a look at these images taken last week. 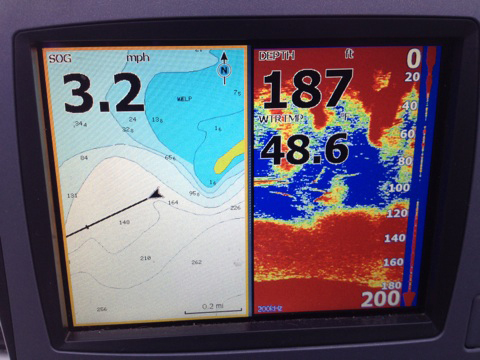 When trolling close to the contour lines my downrigger balls typically stay within about 10 feet off bottom. As soon as my troll pattern takes me into the center of the horseshoe I closely watch where the bait is concentrated and where the salmon appear on my fish finder. My most productive depths here have been 120 and 140 feet, even though the depth ranged from 160 to over 200 feet in some areas. Don’t be afraid to venture into the shallows either. Blackmouth will follow bait into the shallows along the left side of the horseshoe. But remember to watch and work your downriggers as you venture into the shallow area. The chart shows the troll pattern that ranges from 50 to 75 feet. The dark blue area is just 35 feet but does produce fish. Luckily the entire area has a sandy, super forgiving bottom that won’t snag your downrigger balls easily. When in the shallows keep your balls about five feet off bottom. I’ve also seen anglers hook up while dragging their balls. Herring seems to work best in the shallows, but artificial lures work too. Best lures include mini FAT Squids, #2 Kingfisher spoons, Coho Killers, & needlefish hootchies. Best colors include glow, uv, white and green combinations. Leader lengths vary, depending on the lure. A 50 to 60-pound 24 inch leader works great with a mini FAT Squid. Try a 30 pound 36 inch fluorocarbon leader with small spoons. Needlefish hootchies work well with 30 to 40 pound fluorocarbon 28 to 36 inch leaders. Some of the anglers I know cut an inch off the end of the needlefish to match the bait size. If you choose bait, 2/0 or 3/0 single or double hook leaders tied on 40 to 48 inch fluorocarbon 20 pound leaders work well. 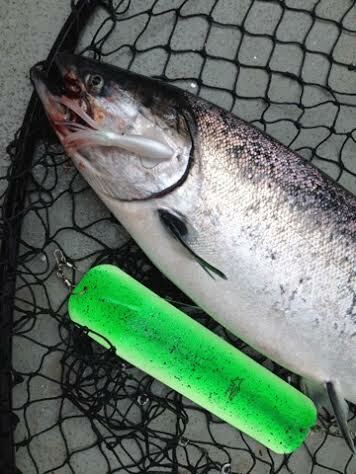 F4 Piscator flashers provide awesome salmon catching action on my squids, hootchies and spoons. Flashers rotate and cause these lures to whip side to side like a fleeing baitfish. Since spoons have their own unique wobble, twitch or flutter they can be fished on longer leaders without relying on the flasher to create the fish attracting action needed to trick salmon into biting. You can use flashers with bait as long as you use a longer leader. However, I much prefer using Goldstar dodgers. Dodgers, when trolled slow move side to side giving the herring a little side to side kick that salmon like. Either whole or cut plug herring will work, but remember to use the right size herring for the predominate bait in the area. Right now the blackmouth are feeding on small two to three inch baits. Productive trolling speeds will vary depending on your direction of troll and the direction of current. The most important factor is the angle of your downrigger lines. No angle means your flashers won’t rotate and therefore won’t give your squids or hootchies action. To much angle and your gear will either be to far off bottom, away from feeding salmon or simply have to much action for the salmon to catch. If you are using only bait, you can troll as slow as you want, as long as the bait still spins. That said, I like to troll at least 1.8 mph to 3.5 mph. Again, don’t focus so much on speed over ground, pay attention to your line angle and whether your lures have action. Good luck, hope to see you on the water. 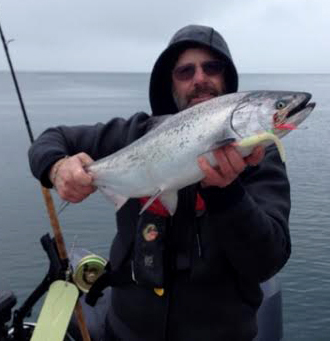 This entry was posted in How to choose lure colors, Salmon Fishing, Salmon Fishing Maps, Salmon Fishing Tackle, Salmon Fishing Tips & Tricks, Washington Salmon Fishing and tagged Protection Island Winter Blackmouth Salmon Fishing Map, Washington Salmon Fishing Maps. Bookmark the permalink.